Welcome to the page where we introduce you to Kindle eBooks! Digital Nomads Guides are published only virtually and not in print. This is because a) it saves the trees and b) we don’t need to convince any editors or publishing houses that our content is good – and it is. You can get your hands on our guides from anywhere in the world within 10 seconds – without actually carrying their weight around. 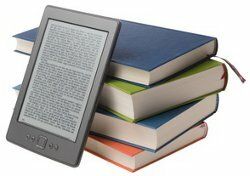 We can also continuously update the eBooks completely free for you so your edition never goes ‘out of print’. These terms are redundant for self-publishing. It creates a lot of freedom for our authors and saves money by cutting out the middle men and other unnecessary costs. This same story is being retold in other words on Amazon’s website. It’s all no big deal, really. Do you want to have an eReader of your own that gives you access to loads of eBooks? The Kindle Paperwhite connects to WiFi and lasts a lifetime. Reviews are what makes or breaks a book – and that’s not any different for eBooks. The authors of Digital Nomads Guides cordially invite you to write a review about any of our travel guides. For this you need an Amazon account as well, but if you successfully bought the book, that shouldn’t be a problem. Just go to the Amazon page of our guides and click ‘Write a Customer Review’. Express yourself!